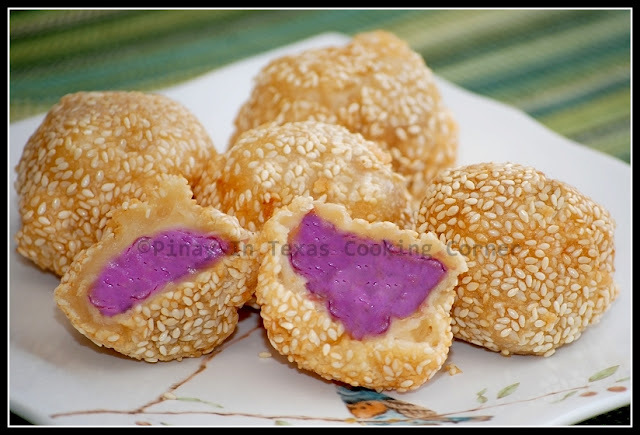 Buchi or butsi is a sesame seed covered pastry made from glutinous rice flour with bean paste filling. It is another favorite Filipino dessert which is an adaptation of the Chinese Jin Deui. We all love buchi…and yesterday, I tried making buchi for the first time. 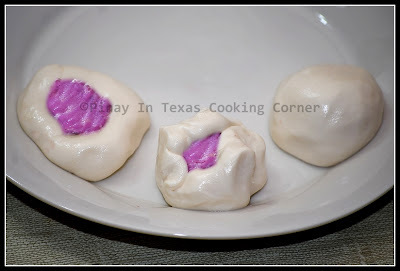 Instead of the commonly used red bean paste, I used ube (purple yam) paste for the filling. 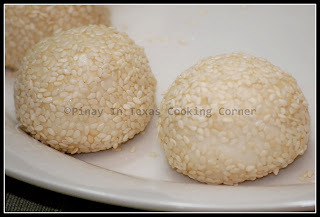 I was able to make 20 pieces of buchi…and now, they’re all gone! Such a delectable treat that is crispy on the outside and soft and chewy on the inside! It’s really worth a try! Prep Time: ~45 minutes* Cook Time: ~5 minutes Yield 20 pcs. * I shared this on Miz Helen's Country Cottage's Full Plate Thursday, It's a Keeper Thursday and Sweeet Tooth Friday. In a saucepan, mix filling ingredients. While stirring, cook over medium low heat until milk evaporates and the mixture is too sticky to stir. This may take 30-45 minutes. Don't stop stirring if you don't want to burn your haleya! Remove from heat. Set aside. 2. In a bowl, mix glutinous rice flour, milk, sugar and water thoroughly to form a dough. 3. Scoop about 2 Tbsp dough and shape into a ball. 4. Press the center of the dough until it becomes hollow. Fill it with ½ Tbsp cooked ube. Seal and shape into a ball again. 5. Place the sesame seeds in a bowl then roll the dough balls over it one by one. Make sure that the seeds stick on the dough. 6. In a pan, over medium heat, deep fry the dough balls for about 4 minutes or until they turn light brown. 7. Remove the cooked buchi from the pan and drain on a paper towel lined plate. 8. Serve as snack or dessert! That looks so good... Like seriously... I want one now! lol! Those look wonderful! So delicious! We have this at Malaysia from the Chinese shops. Looks so mouthwatering, great recipe. Oh I love Buchi! Thank you for the recipe - I'll have to make them soon... I haven't had one in years! The color is outstanding! They look delicious! These look awesome! Love the purple! that color and texture look wonderful! yummm! Your Buchi dessert looks like so much fun. I love the inside color and the little bun is precious. I really want to try to make this little treat. Thank you so much for sharing with Full Plate Thursday and please come back! Oh man ube... I remember my grandma having to hire an unsuspecting kid to stir this! Tried this today and the other day, for sure I will make more for the following days <3 thanks mucho Tina! Hi Tina. I love buchi but with the sweet monggo filling. Do you have a recipe for a sweet monggo filling? Thanks. 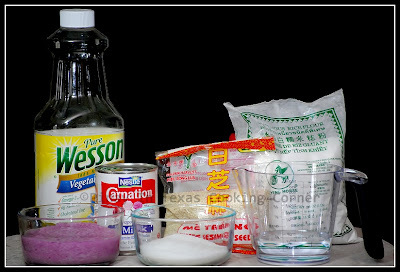 I'm not a fan of mung bean paste so I haven't tried making it...but here's a recipe from one of my fave blogs: How to Make Mung Bean Paste. Hope this helps! Thanks for the recipe! Have you tried making them ahead and freezing to fry at a later date? Sorry Melissa, I haven't tried that. Buchi is my all time favorite. Thank you so much for sharing this recipe.